William Morrow and Company, Inc. Used - Very Good. Very Good condition. Good dust jacket. William Morrow and Company, Inc. Collectible - Good. First edition copy. Collectible - Good. Good dust jacket. Bookplate inside. Stamped on inside. 1987-09-03. Good. Ships with Tracking Number! INTERNATIONAL WORLDWIDE Shipping available. May not contain Access Codes or Supplements. May be ex-library. Shipping & Handling by region. Buy with confidence, excellent customer service! 1998-08-06. Good. Ships with Tracking Number! INTERNATIONAL WORLDWIDE Shipping available. May not contain Access Codes or Supplements. May be ex-library. Shipping & Handling by region. Buy with confidence, excellent customer service! Amereon Ltd, 1976-12. Hardcover. Good. William Morrow and Company, Inc.. Hardcover. 0688049397 New Condition *** Right Off the Shelf | Ships within 2 Business Days ~~~ Customer Service Is Our Top Priority! - Thank you for LOOKING :-) . New. William Morrow and Company, Inc.. Hardcover. 0688049397 New Condition. . New. Penguin. PAPERBACK. 0140279008 Very Good Condition. Five star seller - Buy with confidence! . Very Good. THE NIGHT LIVES ON : New Thoughts, Theories, and Revelations about the "Titanic"
New York: William Morrow and Company, Inc.. 1986. Fourth Printing. Hardcover. 0688049397 . Near Fine in a Very Good+ price-clipped dust jacket. Edge wear and soiling. ; 8.20 X 5.40 X 1 inches; 272 pages; Original dust jacket protected by archival Brodart cover. All domestic orders shipped protected in a Box. .
William Morrow and Company, Inc, 1986-08-01. Hardcover. Used:Good. New York: William Morrow and Company, Inc.. 1986. Fifth Printing. Hardcover. 0688049397 . Near Fine in a Very Good+ dust jacket. Scuffing to front and rear panels. Wrinkling to upper front and rear panels. Edge wear. ; 8.20 X 5.40 X 1 inches; 272 pages; Original unclipped dust jacket protected by archival Brodart cover. All domestic orders shipped protected in a Box. .
New York City: William Morrow, 1986. 1st Edition. Hardcover. Near Fine/Near Fine. 8vo - over 7¾ - 9¾" tall. Beautiful First Printing, square, tight and clean throughout. A bit of toning on the top edges of boards. Equally attractive unclipped dust wrapper is fresh and bright with no creases, chipping or tears.The tiniest of nicks to the crown. A beautiful collectable copy. 1986-03-03. Good. Ships with Tracking Number! INTERNATIONAL WORLDWIDE Shipping available. May not contain Access Codes or Supplements. May be ex-library. Shipping & Handling by region. Buy with confidence, excellent customer service! William Morrow and Company, Inc.. Hardcover. 0688049397 Like New Condition. . Fine. New York: William Morrow and Company, Inc., 1986. Reprint Edition . Hardcover. Near Fine/Near Fine. 8vo - over 7¾ - 9¾" tall. Fine blue hardcover. Near fine blue color pictorial DJ. Light use, clean interior. (1986), 8vo, , 11-272pp. "It happened on a cold April night in 1912. The magnificient new liner Titanic, proclaimed unsinkable, struck an iceberg i the mid_Atlantic and went down with an appalling loss of life. It was one of the great news stories of all time. 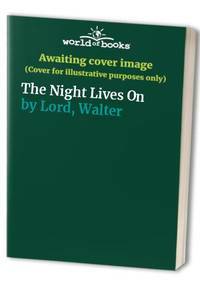 In the years since then Walter Lord has continued his research into every aspect of the story, and the result is this fascinating companion volume that explores many of the riddles that have long puzzled both the experts and readers. New York: William Morrow, 1986. 272pp, 16pp of b/w plates, index, illustrated eps. Cloth-backed papered boards in dust-jacket. New thoughts, theories and revelations about the Titanic.. Reprint. Hard Cover. Very Good/Very Good. 8vo. Thorndike, ME: Thorndike Press. VG. (1986). Large print. Owner note top title page, top part of 1st flyleaf cut away. How well built was the Titanic, why were there so few lifeboats? .